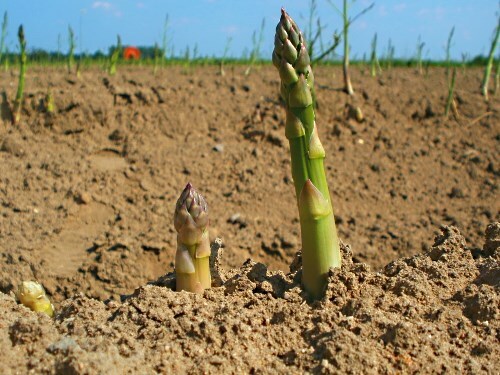 Asparagus plants are members of the lily family and the edible parts are the young shoots or 'spears' sprouting from the tuberous roots or crowns. The ancient Egyptians ate asparagus - the Greeks thought it grew from a rams horn buried in the ground - the Romans took it with them on their conquests. Growing asparagus successfully you will need to have (or create) an area of free draining soil and plenty of space - it will lock up the bed for 10-20 years... but, oh boy! - it will be well worth it! When planting asparagus choose a shelterd sunny spot... strong winds can play havoc with the tall foliage which grows after the cropping period has ended. Good drainage is essential - dig the bed thoroughly in the previous autumn/fall and dig in liberal amounts of well-rotted manure or compost. This will give the asparagus ferns access to all the nutrients they require as well as retaining moisture within the soil. Add lime if the soil is very acid. If you have tested your soil these vegetables prefer a pH of 5.5-6.5. A thorough weeding is recommended... especially remove deep rooted perennial weeds so they don't compete with the asparagus crowns. Break soil down in March and rake in a general fertiliser. 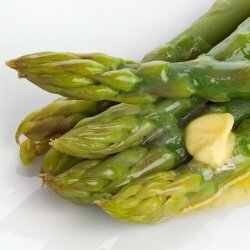 When planting asparagus, it is possible to grow it from seed but it will take three years before you can have your first meal...and that would be taking patience to extreme levels - so it makes more sense growing asparagus plants from established crowns and reduce the waiting period to two years. Start planting asparagus crowns in late March or early April in the bed you have prepared. Dig a trench 20-25cm(8"-10") deep and 30cm(12") wide. The distance between trenches is open for debate but a good rule-of-thumb is if you have plenty of area then space the trenches 90cm(36") apart - if not then 45cm(18") will be fine. The soil you have dug out for the trench should be left along its edge as you will cover the crowns over a period of time - layer upon layer. Space the crowns about 40cm(16") apart in the trenches on 5cm(2") high mounds of rotted compost or manure. These mounds are created only below each asparagus crown and the roots fanned out across them. Cover the crowns with 5cm(2") of sifted soil after the roots have been fanned out. Fill in the trench gradually as the plants grow until level. Thats it... planting asparagus wasn't that difficult, was it! Well, except for the aching back maybe ;-). Around February/March time give the bed a dressing of general fertiliser - 90g per sq/m, and before the spears of asparagus appear make a mound of soil along each row several cm deep. Asparagus plants are male and female. The male is the more productive one... I'm saying nothing ;0). The female is berry bearing. Asparagus Beetles and their grubs just love 'em and can decimate your crop of delicious asparagus - so be vigilant. Eggs are laid in a line on the foliage - like a line of soldiers - they are long and stand out on their ends. They will chomp their way through the spears, and the foliage which appears after harvesting... this will weaken your plants for next years crop. Try the following ways to keep them down or eliminate them. See 'Pest Control' - 'Slugs' French Beans for some ways to minimise problems. You've made all that effort in preparing for this moment and you're ready to cut... STOP! Even the year after planting asparagus it is not good news for you - do not cut... ok I'll make an exception in your case, just cut one or two from each plant - but no more. The second year after planting asparagus is when things get earnest, are you ready to cut now?...ready-Steady-GO! Immediately the spears get about 10-13cm(4-5") high they should be cut about 5cm(2") below the soil surface. The stems are quite tough so use a strong serrated knife or you can purchase special asparagus knives. Cut frequently during the cropping period of six weeks during May and June - don't let the spears get too tall - cut every day if necessary - if you have too many, you could make a neighbour happy. Stop cutting after six weeks and allow the spears to develop into ferns again to prepare themselves for next years crop of delicious asparagus - don't be tempted to go on cutting - you definitely will be the loser.